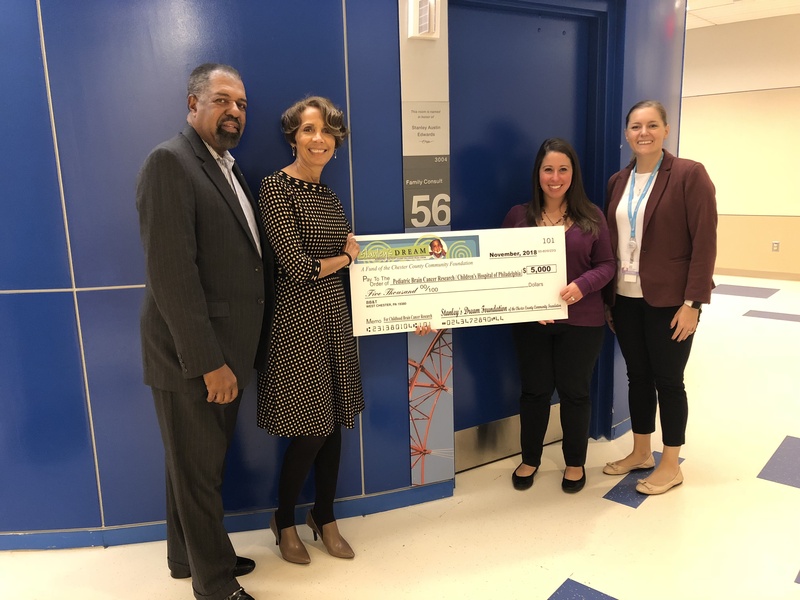 West Chester, PA — On November 8, 2018, Donna and Stanley Edwards presented a $5,000 grant check to Jenna Bundy, Associate Director of Community Fundraising at the Children’s Hospital of Philadelphia (C.H.O.P. ), to fund the Hospital’s childhood brain cancer research projects. The grant represented a portion of the proceeds raised by the Stanley’s Dream Fund in honor of their son, Stanley Austin Edwards, who passed away from brain cancer in 2002. Stanley’s primary doctor at C.H.O.P. was Dr. Jean B. Belasco. This is the twelfth gift to C.H.O.P. representing over $85,000 in grant awards in an ongoing effort to fund research to find a cure for brain cancer. In 2017, a $10,000 grant was made to C.H.O.P.’s Buerger Center for Advanced Pediatric Care and a room was named in Stanley’s honor. This year’s grant presentation took place in front of that room. The room is used for patient families to have private meetings. The Stanley’s Dream Foundation also awards scholarships each year to graduating Chester County high school students in honor of their son. To date, approximately thirty eight scholarships totaling over $ 64,000 have been awarded in Stanley’s memory. Stanley Austin Edwards was a gifted athlete and devoted student who dreamed of attending Notre Dame University. Stanley was diagnosed with brain cancer when he was in 7th grade at age 12. After surgery to remove the tumor, Stan developed learning disabilities, due to the tumor’s location, as well as paralysis in his right arm, preventing him from participating in the many sports that he so loved. Stanley passed away at age 14 while a freshman at Henderson High School in West Chester. Stanley’s legacy is kept alive through awarding grants and scholarships in his name to further childhood brain cancer research and to assist students in attaining Stanley’s dream. Stanley’s Dream Fund will be holding a 5K Walk & Run January 1, 2019. Information regarding this and other future events can be found at www.stanleysdream.org. All proceeds benefit the STANLEY’S DREAM FUND managed by the Chester County Community Foundation. For more information regarding Stanley’s Dream or the Chester County Community Foundation, contact www.chescocf.org or 610-696-8211. Headquartered in West Chester’s Historic Lincoln Building, the Chester County Community Foundation connects people who care with causes that matter, so their legacy philanthropy makes a difference now and forever. The Community Foundation holds nearly $60 million in trust and annually awards $2.5 million in grants and scholarships. www.chescocf.org.